Be positive and curb the complaints. It sounds easy, but that's hardly the case. In the age of social media, there's no shortage of advice on how to build a better organization. Often targeting those in leadership positions, the recommendations tout the usual fare: empower employees, highlight successes, turn failures into learning moments, and more. This is all great advice and important for leaders to remember, but what about the roles and responsibilities of the rest of the organization? The principle of synergy, first defined by Aristotle, is an effect that, in its total, becomes greater than the combined sum of the individual parts. When groups of people come together to solve a major problem or create something wonderful, synergy is at work. Tremendous progress can be made when the group's energy is channeled toward its highest potential. The first moon landing, the fall of the Berlin Wall, and sequencing the human genome are world-class examples of synergy in action. On a less grandiose scale, the potential for synergistic results are stored like energy reserves ready to be tapped in HIM departments across the country. Exhibit A of the synergy potential found in HIM departments is the quiet transition to ICD-10 last October. The combined energy channeled into training, developing new processes, writing new guidelines, and thinking differently about the coding process culminated in a relatively uneventful shift from ICD-9 to ICD-10. None of the dire predictions came to fruition and, with rare exceptions, hospital and health care revenue cycles continued their robust support of operations in organizations large and small. A huge undertaking, the transition would have presented major implications had it gone wrong. Doomsday was avoided because everyone from entry-level coders to the most senior executives understood the risks, the consequences of failure, and—here's the key—the role they needed to play in order to support success. In the transition to ICD-10, everyone understood their roles in the process. No one declared they were going to continue to code in ICD-9, no one refused to attend training (at least no one still employed in a coding department), and no one insisted that ICD-9 was the only way to effectively code records in 2015 and beyond. Certainly, many had trepidation about their ability to make the switch from ICD-9 to ICD-10, but there was near-universal recognition of the need for the change. Many groaned about the amount of work involved but saw its necessity and rolled up their sleeves to participate anyway. Everyone viewed his or her role as important and made sure to do what was necessary to contribute to the success of the project and, ultimately, the organization. Once things return to business as usual following a major change or project, the most common concerns heard in HIM departments involve the engagement and motivation of employees, minimizing interpersonal (and intradepartmental) drama, and staying focused on opportunities for growth and improvement. 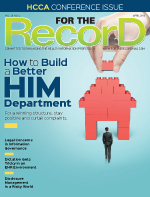 Building a high-functioning department in HIM or any other health care specialty is no different than undertaking an ICD-10-sized project, and yet this kind of change is rarely viewed through this lens. Change that targets a team's soft skill sets can seem elusive and even impossible. The good news is that it's just as achievable and, if approached correctly, much simpler. When the discussion of changing from ICD-9 to ICD-10 first became a national conversation, there were corners of the HIM world that declared it would never happen. "ICD-9 is too integral to the revenue cycle to be disrupted." "This will never fly with doctors." "All the experienced coders will retire, then what?" ICD-10 is proving itself to be a worthy successor to ICD-9. Some physicians are still grumbling, but they are also learning to roll with the changes. And while there were coders that retired, many stayed and new ones came on board, too. When planning a new direction in the HIM department, it's important to recall the protests levied against past projects as well as the outcomes. Count on there being resistance, along with predictions of failure and veiled intimidations. However, these have no power on their own—they're just words. The countering actions put in place by each person committed to positive change will supersede the negative pronouncements and, as was the case with the ICD-10 implementation, can seed a wave of change that will neutralize any gloomy forecasts. A key ingredient to the success of the ICD-10 changeover was the unspoken agreement across the HIM profession and the larger health care delivery system that this was an "all hands on deck" proposition. Because of the journey's inevitability, in no corners were there clusters of professionals who refused to come along. Aside from a few lobbying physician groups, most of the health care world knew that ICD-10 would undoubtedly replace ICD-9. It should be no different when tackling the kind of change that targets attitudes, behaviors, and other soft skill sets in a department. Leaders must adopt the same kind of singular vision: Here is the target objective, these are the steps, and this is the evidence that will measure success vs failure. And while solid leadership is critical, the truth is that, like the ICD-10 implementation, success depends on each individual's commitment to change. The attitude of individual staff members is one of the greatest challenges to building a high-functioning department, making it imperative that individuals are held accountable for their words, actions, and attitudes. An attitude-focused initiative differs from the ICD-10 transition in that coders who may have refused to learn and use ICD-10 could have been dealt with in a straightforward manner. It is difficult to mandate that team members adopt a positive attitude; in fact, that type of perspective runs counterintuitive to the end results being sought in a program dedicated to positive change. The key to success lies in getting the team to understand that the changes should be welcomed not only on an individual level but also from a departmental perspective. That change must be supported through words and action. Once the decision to make positive change has been made, the next step is to decide whether to adopt a formal program or to work on the initiative in steps, one idea at a time. While there are plusses and minuses to each strategy, the best fit will be unique to the organization's mix of people, personalities, and circumstances. For groups that prefer a simple, nonprogrammatic approach, adopting an agreement among all team members to assume all interactions are grounded in good intent (or at least neutral intent) is one option. Think of this as a variation on the Hippocratic Oath, which, broadly summarized, represents the concept of "first do no harm." To mold a high-functioning team, flip to a "first assume no harm intended" perspective, applying it to all communication and actions. This simply means that regardless of the tone of voice used, the manner in which something is placed on a desk or handed to someone, or the way a question is answered, each team member agrees to make the assumption that it was done with good intent. In cases where good intent is arguable, the agreement is to assume neutral intent. The exchange may not have been cloaked in kindness, but the slip-up may have been due to a distraction and not intended to be a personal attack. The potential for drama, disgust, disdain, and disagreement vaporizes when the receiver assumes it's "all good" and commits to taking no offense in any interaction. Beyond the face value of improved communication, this perspective allows each staff member to accept that there may have been extenuating circumstances that triggered the uncomfortable interaction. No one can really know the path another has walked prior to an encounter or exchange. Are they dealing with a family situation or a newly diagnosed illness? Are they experiencing financial difficulties or facing a major life decision they are struggling to resolve? Stop for a moment and think about how the conversations in a typical HIM department may change if every exchange was presumed to have good—or at least neutral—intentions. Establishing this point of view can help team members avoid becoming a TOP (ticked-off professional), an angry sort whose mood rarely moves beyond sour. Similar to toy tops that have two tricks—spin and fall over—these TOPs are predictable. They get all spun up about something and complain for the rest of the day (or longer) about the person or circumstance, or they become disengaged. Rarely are they appreciative or grateful, and it's newsworthy when they engage others with a smile on their face. Their behavior is so predictable that when they are quietly helpful, everyone wonders if they are under the weather. By making a commitment to assume everyone is placing their best foot forward, departments and organizations can reduce negative energy. In some health care organizations, a conversation and informal agreement to put on a smile is all it takes to effect incredible changes. For others, a more formal approach, such as the Complaint Free World program created by Will Bowen, may work better. In his program, Bowen shares data on how often the average person complains and how complaining is detrimental to relationships, health, career, and life in general. In addition, and most importantly, he offers suggestions on how to stop complaining and change the nature of conversations at work, home, and elsewhere. The most compelling aspect of the Complaint Free process lies in the realization of just how often people complain in everyday conversations: 15 to 30 times, according to the research. Bowen's suggestion for stemming complaints is to use a silicone rubber bracelet. The idea is to move the bracelet from one wrist to the other each time a complaint is spoken. He recommends setting a goal of going 21 consecutive days with the bracelet staying on the same wrist. It may sound simple, but it's not easy. As it turns out, complaining is a lot like breathing for many people. Curtailing complaints relates back to synergy, the collective energy that becomes larger and more significant than the sum of individual contributions. How might an HIM department's energy level change should everyone elect to go complaint free and assume every interaction is well intentioned? The results could be staggering. To make an impact, it may be assumed that a manager or a director must initiate change on this scale. However, that's not necessarily the case. While a departmentwide effort may need to be initiated by the formal leadership team, many constructive outcomes can emerge from the decision of a single person to make changes in his or her own life. From there, a snowball effect can occur as the combined energies of the group lead to a reenergized work environment. Whether launching one of these ideas from a single cubicle or across the organization, there are several parameters that will support successful outcomes. First, be willing to be human. In other words, be willing to be wrong. Health care leaders are just like everyone else in that they will sometimes assume a negative intent and they will sometimes complain. No one is perfect, and trying to be perfect is not a useful learning tool anyway. Sustainable leadership behavior embraces humanity. Be open about falling short and admit when it has been a bad day, week, or even month. It not only allows everyone to see that the initiative is important but also demonstrates that everyone is in it together. On the flip side, leaders should grant the same courtesy for others to be human when things aren't going well. Second, avoid pointing out colleagues' shortcomings. Shifting to a perspective that assumes others are filled with good intentions or eliminating complaining is a personal journey. The best way to lead others is to live the example, not to make others an example. Don't hesitate to reward positive behavior. When team members rise above situations that would have previously descended into a complaint-fest, that's a major win, so celebrate accordingly. Lastly, recognize that sometimes life takes a detour that derails even the most well-intentioned efforts. Be willing to refocus on the effort to improve. The end goals are worth the investment of time, energy, and attention. The secret to building a high-functioning team in any organization lies in the willingness of all the staff to foster a more positive environment. Even a handful of people can make a difference. The benefits of shedding TOP behavior and curtailing complaints can seed significant change. Plant those seeds, water them with positive decisions, watch them grow incrementally, and witness the synergy move HIM to its potential. — Rebecca Harmon, MPM, RHIA, CCA, who returned to professional practice after spending years as an HIM educator, enjoys writing and speaking about ways to improve the HIM workplace.